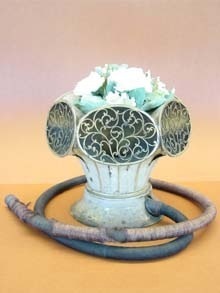 The Flower Vase, manufactured by F.C. Rein, London, about 1800, is an early model of a multiple sound receptor hearing device and was designed to be used as an ornate centerpiece for flowers or fruit. Each of the six openings "receptors" acted as sound collectors with the sound conveyed by a tube hidden under a table runner or napkin to the user's ear. This hearing device is from the Central Institute for the Deaf - Max A. Goldstein Historic Devices for Hearing Collection at Washington University Bernard Becker Medical Library in St. Louis, Missouri. Copyright © Bernard Becker Medical Library. Used with permission. This month, D-Lib's featured collection is Deafness in Disguise: 19th and 20th Century Concealed Hearing Devices. National Digital Newspaper Program, Catalog of Federal Domestic Assistance (CFDA) Number: 45.149, National Endowment for the Humanities: Division of Preservation and Access. Posted August 10, 2006. Call for proposals. Deadline: November 1 for projects starting after May 2007. Electronic Resources & Libraries 2007, 22 - 24 February 2007, Atlanta Georgia, USA. Call for papers. The submission date is 1 November 2006. 29th European Conference on Information Retrieval, 2 - 5 April 2007, Rome, Italy. The submission deadline for posters is 6 November 2006. Mellon Fellowships for Dissertation Research in Original Sources, 2007. The application deadline is 15 November 2006. ICEIS 2007 - 9th International Conference on Enterprise Information Systems, 12 - 16 June 2007, in Funchal, Portugal. Call for papers. The submission deadline is 23 November 2006. Copyright Education Programs: Teaching the Ethical and Legal Use of Information, 6 - November 2006. Online workshop.